Back to focusing on what goes into my body and creating meals that are hits with EVERY member of the family (well…I try at least 🙂 ). This one, however was one! Thought I’d share! Mix Arborio rice and olive oil in sauce pan and heat over medium to high heat until the rice starts to turn golden. Add 1 cup of vegetable stock to rice, over medium-high heat and stir until absorbed. After this, continue to add stock, 1/4 a cup at a time until the rice has become soft (but not mushy!). In the meantime, cook your sweet potatoes. My method? Wrap them in saran wrap and cook in the microwave, 5 minutes per potato! Peel and slice sweet potatoes into cubes. 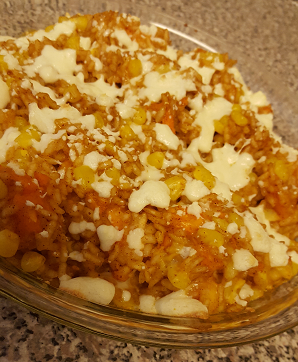 Combine arborio rice, sweet poatoes, corn and spices. 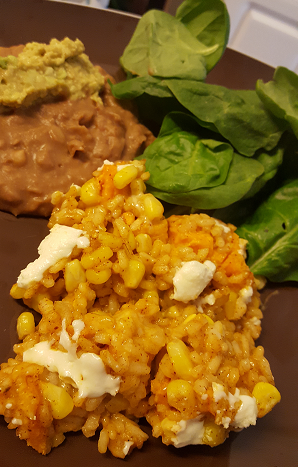 I served with a side of fresh spinach and refried beans with homemade guacamole!